A generous stealth sandbox masterpiece that'll delight both new and existing fans of Metal Gear. Open world sequel to a previously console-only cult stealth series. I’ve failed this assassination mission three times now. Each attempt, while searching for an enemy informant who can tell me where my target is, I'm almost immediately spotted by an enemy guard tower in a nearby camp. Spooked by the sudden gunfire, my potential victim makes a prompt getaway by helicopter. The chopper moves too fast for me to hit it, and it’s gone. Mission failed. But how about this: screw the informant. Forget the objectives. How can my target escape if I make sure there’s no helicopter to begin with? The getaway chopper I’m looking for doesn’t just spawn out of nowhere—like everything in The Phantom Pain, it’s part of the environment, circling a hill some distance away, waiting for its passenger. I search the helicopter out based on its flight path from my three previously failed attempts and hose it with my grenade launcher until it’s in flames. I just got rid of the problem. No escape. Within five minutes, I’ve killed both my target and the informant by accident, firing rockets randomly at anything that moves. Miller, my mission handler, isn’t pleased I killed the informant without interrogating him first, but the game doesn’t mind. Mission complete. Metal Gear Solid V celebrates your choices and ingenuity more than any sandbox game I’ve played in years. This mission, and so many others, enables players to figure out the strategy that works for them and run with it. This is a reinvented, systemic Metal Gear Solid with an almost Far Cry-like open world structure, elevated significantly by the choices and subsequent one-off moments you’d encounter in a Hitman or Deus Ex. Crucially, too, The Phantom Pain retains the oddness, detail and some of the character of the MGS series. A few of my stealth playthroughs that suddenly went wrong became my favourite moments in MGSV. I forfeited a perfect kill-free stealth run of one mission because I couldn’t get a good enough sniper angle on my target before he took off in a chopper. Sprinting up flights of stairs to the helipad, my victim spotted me just in time for me to throw every grenade in my inventory under the chopper, destroying it, vanquishing him and knocking me over, before I made a ludicrously frantic escape on horseback. It was amazing, and I’m not sure it would’ve been vastly improved had I silently shot the guy and snuck out. Like Ground Zeroes, The Phantom Pain’s PC port is really well-optimised. My PC’s specs are pretty decent, but my GTX 780 is two years old, and even with every setting on ultra high I didn’t notice a framerate drop beneath the low 50s, and even going below 60 was pretty rare. Dropping a couple of the settings here makes a consistent 60fps easy to attain. Like Ground Zeroes, though, the lack of mouse control in the menu screens means this is better played with a controller. The Phantom Pain is a long game that takes upwards of 50 hours to see everything, and it took me a decent chunk of that time to learn the way everything works. In the field, visibility is affected by the day-and-night cycle, and when you’re deep into an enemy base and the sun comes up, it can be the difference between a perfect stealth playthrough or the final set-piece from an ‘80s action movie. In one base I smugly switched the power off at night to take out a few lights that risked exposing me, only for the sun to come up moments later and a patrolling guard to spot me immediately. I love this as an unpredictable factor in a stealth game, as well as the changing weather conditions like sandstorms or rain, because it’s dramatic and exciting to have something alter your odds mid-mission that you can’t control. The list of stuff to do in The Phantom Pain is divided into main story missions and Side Ops, and while the latter is mostly composed of optional missions, there are some key shards of story within them, too. It’s almost like an RPG quest structure, with both strands earning you GMP, MGSV’s currency. What happens along the way is often unexpected and almost always exciting. I’ve seen all of The Phantom Pain’s elements feature separately in other games, but not brought together in quite this way. I love that the end-of-mission scoring system rewards a multitude of different playstyles, and not just the stealth-only approach. While there are heavy bonuses for ghosting and penalties for being caught by the enemy, you’re also strongly rewarded for headshots or speed. I think this encourages players to be more experimental, and not to feel like it’s the end of the world if they’re spotted. This is a game where it feels great to fire a gun, and you’ll have dozens in your inventory. You should totally use them. I recommend The Phantom Pain without question to someone unfamiliar with the series. In fact, I think existing Metal Gear fans will be the hardest for The Phantom Pain to win over: the structure is just so different, and a few boring early levels which are functionally tutorials initially made me feel like they’d accidentally purged all the fun elements out of Metal Gear. But once I reached the eight-hour mark, I realised how in love with it I was, and how much fun I was having just doing daft stuff like trying to blow up a bear with C4, lobbing a sleeping guard off a cliff to his death or Fulton-ing a tank into the air with a dude inside because I was too lazy to blow it up. It’s not like these moments happen every few hours in MGSV; they occur in pretty much every mission. They’ve built a world that lets the chaos unfold, and it never stops being impressive. The environmental design feeds into this madness perfectly, and some of the backdrops to missions are gigantic, with loads of points of entry. While as open worlds they feel a little quiet and spread out, the more populated areas of refineries, abandoned towns or palaces are all like playgrounds that encourage repeat runs of missions. I’d happily swap the old Metal Gear hub environments for these any day. In retrospect, they feel like prototypes for what the team at Kojima Productions truly wanted to build. From a Metal Gear fan’s perspective, I think the pared-down story may disappoint, and Kiefer Sutherland’s performance as Snake, while fine, is so rarely heard in cutscenes that he might as well not be there at all. Specifically for a PC audience, though, some who I assume have only played Ground Zeroes before, the lack of an overbearing mythos makes this very easy to digest—and I think on balance that’s a much better approach than pandering to fans who know the lore inside out. 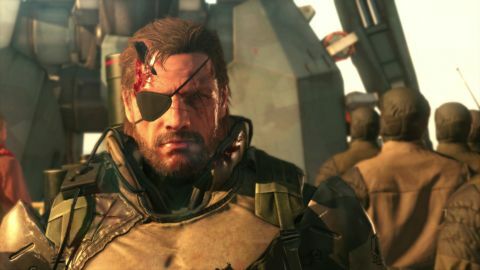 There are some parts of old Metal Gear that would’ve made a welcome transition, though: other than a couple of great sniper duels and one larger fight I can’t talk about without spoiling, I thought the selection of boss fights was pretty dull, particularly an annoying recurring scrap with some cheap zombie soldier men that are little more than bullet sponges. Bad boss fights occupy less than hour of MGSV total, though, and that’s a tiny fraction of my playtime so far. This is an oddly massive experience, with a pretty extensive and challenging endgame, too. Even the most basic playthrough will clock in at 25 hours, and those that really get deep into experimenting with the game will easily reach 50 hours+. That time has sailed by. I’m truly obsessed with The Phantom Pain, and I think it’s a dazzling example of how exciting open world game design can be. Not just being set in a big or beautiful world, but having the building blocks in place to let players have moments that feel like they belong to them. This is the best I’ve seen that done to date. Metal Gear Solid V is a standard-setting sandbox game that makes perfect sense on PC, and is likely to be the most influential Metal Gear Solid game since the first.